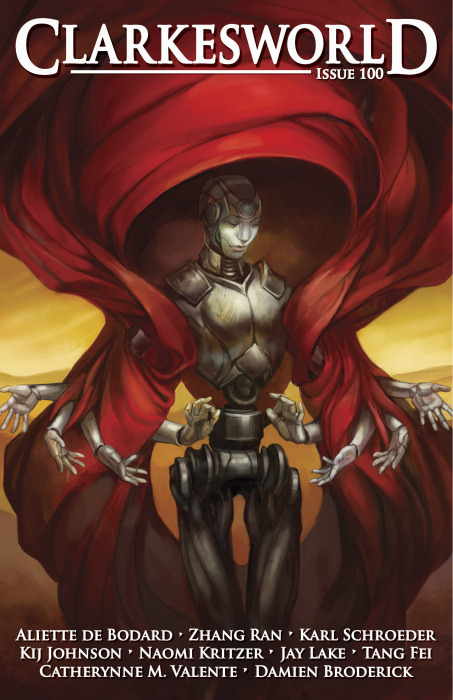 "Three Cups of Grief, by Starlight," by Aliette De Bodard [bio] (edited by Neil Clarke), appeared in Clarkesworld issue 100, published on January 1, 2015. Pro: The story cleanly depicts several aspects of the Dai Viet empire without needing the reader to have already read more of the series. Con There is no actual story here. Nothing actually happens, and no one makes an "inner journey" either. There are several belief-destroying bits that didn't seem necessary to the story: Plants that grow in starlight instead of sunlight. Technology that lets ship brains live centuries yet has no way to extend life for normal people at all. Implants that record personalities that are safe for relatives to use but somehow dangerous for non-relatives. Implants that, for some reason, cannot be copied. The whole idea that it could be cost-effective to import food from space. Making hybrids between terrestrial and alien plants. The idea that a mind--essentially a human cyborg--would become unbalanced if it were told that given station could tolerate a higher amount of fire than usual.